5.0/5 out of 600 votes. 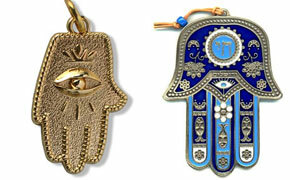 This powerful Magical Eye Amulet is designed to accomplish two things: Attract the Good and Repel the Evil. Directs positive energy with your "Good Eye" to stimulate the subconscious mind of someone of importance to you, allowing them to look at you in a loving, positive light. The Magical Eye magnifies your gift of foresight to clearly see what lies around the corner. Then it illuminates the way to your true path in life so you can avoid the pitfalls and take advantage of the wonderful opportunities that lie ahead in your relationships, in your finances, in all areas that affect you. What the Magical Eye Can do for You: Gives you the ability to see things clearly. Gives you the gift to have greater insight into people, relationships, investments, Gives you the understanding and confidence to clear up misunderstandings, Simplifies getting important relationships back on track and Protects you from the Evil Eye. How does Magical Eye Amulet work? - Feel the energy flow through your entire being, infiltrating your subconscious with awesome positive vibrations. - Feel your head clear, bringing clarity and courage that will invigorate you. - Think about the person you love and transfer your loving thoughts to them! - Concentrate on someone who has tried to undermine you, perhaps destroy you. Soon this person will feel negative energy flow through their veins. - Attracts positive energy as if it were a magnet. Stops negative energy in its tracks. - If you're ready for a loving relationship, prosperity and ultimate happiness, take possession of this mystical amulet and get ready for a remarkable change in your life.